When I announced to my New York friends in 2005 that I was leaving for law school in Nashville, TN, everyone had wisdom to offer. A fellow traveler who spent high school musing on Nietzsche with me said that some Southern gentleman would likely sweep me off my feet. That’s not what this love letter is about. And for some reason I believed her. I began dreaming up my store and never for a moment thought back to those kids I wanted to save. I just kept building. And I built what was later lovingly referred to as a magic little house on 12South. (I’m not bragging; people called it that!) I lined the inside with dark wood and leather-bound books, because I wanted it to look like the small libraries at Yale, the first home I had ever chosen for myself where once upon a time I felt safe. It was a house masquerading as a retail establishment where we sold lemonade on the porch, hula-hooped on the lawn, and held high school days where fashion-minded teens could “intern” for a day. It was a home more than it ever was a store. And then we grew up, moved to something bigger, and dreamed accordingly. It was a playground where you could stay all day and chat. I’d serve up college counsel or resume editing from behind my bar, as if those were the services rendered. We’d sing or play pool or laugh or cry. You’d stay all day even though you had only popped in on your way to Whole Foods. It was home for us. The hatters were always slightly mad, the rabbits were always late, and no one ever lost their heads. It’s not that I set out to build a haven for the wonder-minded, but let’s be honest: I put a giant wall of graffiti in the middle of the Hill Center where a Vera Bradley now sits. Surely, I was announcing something. So, it seems that somewhere along the way I lost sight of my mission. I just kept building what felt natural, but it seems I built the very thing I was supposed to let go of. I built a place for us to feel safe and welcome and empowered. I built us a home. I built us a wonderland. My friend might have been wrong. You do hurt, sometimes like me, sometimes like you. And you do laugh. And you live, and you love, and you wear clothes. We all do. So, thank you. All of you. I built for you and with you, and somewhere along the way I wove my heart back onto my sleeve. Happy love month, bunnies. 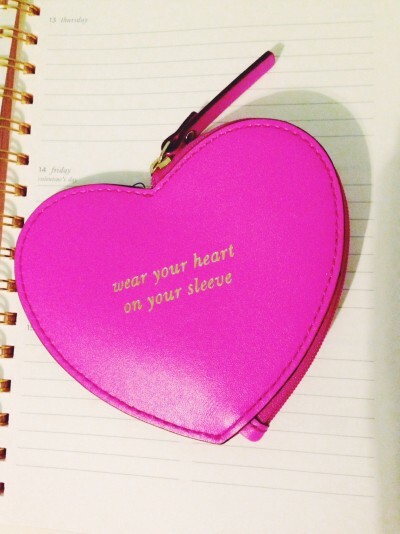 Let’s wear our hearts wherever we can! With one month left, it seems only appropriate that we begin a little two elle retrospective, but this time we want your help. Our Good & Fair t-shirts (still great holiday gifts and now on sale. just sayin.) beg us to remember that there’s a story behind every wardrobe, and we couldn’t agree more. My story plucked me out of Manhattan and set me here in Nashville. It plunged me down a rabbit hole and began the journey that you’ve all been a part of with me. This journey, while thrilling, took me away from the worlds I knew and asked me to create a new one. I’ve missed a best friend’s wedding, and I’ll miss another in a week. I’ve sold clothes for 10 out of my last 15 Christmas Eves, and I’ll do so one last time for you. With the sacrifices, however, came great joys. I’ve been afforded the opportunity to dream. I’ve turned a white box into a wonderland. I’ve found a staff that makes it so that I can’t take a day off, because I don’t want to miss a day of their company. 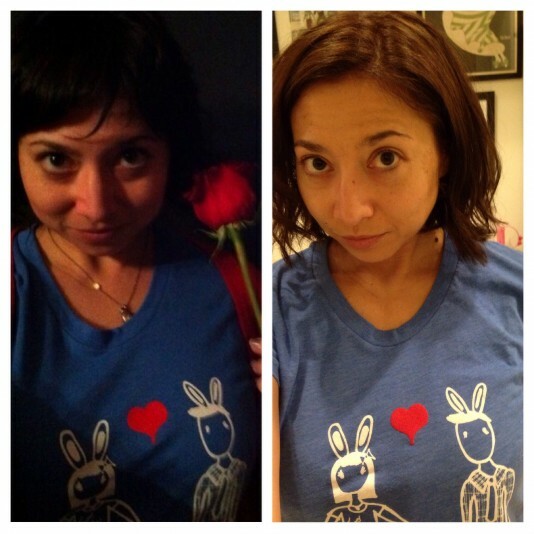 And, of course, I’ve created the bunny and Nashville shirts that are now filling my closet. So, here’s what, bunny lovers: SHOW US YOUR TWO ELLE! 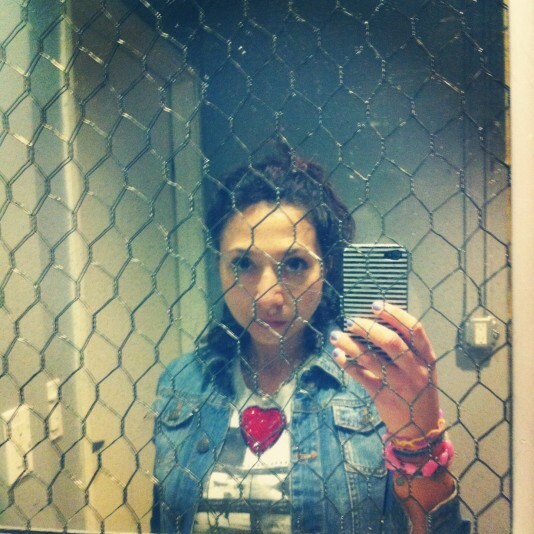 Send pics of your faves to info@twoelle.com with perhaps a couple choice words, and your story will be added to ours. You’ve been listening to ours for all these years, but now we want to share yours! TELL US YOUR STORY! 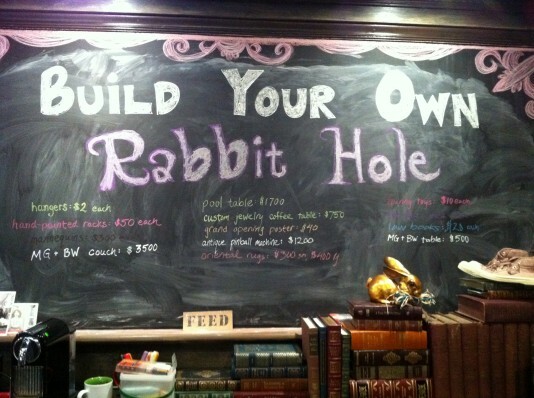 Friends, we’ve filled your closets, but have you ever wished that your home looked a little more like our rabbit hole? Well, we’re making that dream a reality by selling every piece of this little bunny bunker. Seriously, every non-living thing you see can go home with you for a small fee (aka, Frank is not for sale). 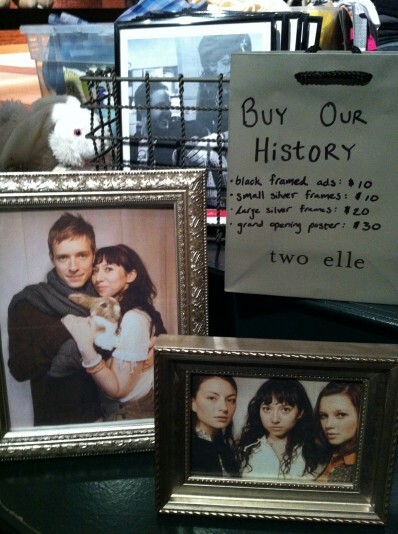 Some items have already sold, so come by soon or email info@twoelle.com. We’ll miss you, Nashville, but this way you can take a piece of us home! Once upon a time, a girl had an idea. She envisioned a wonderland where people of all ages, genders, and backgrounds could come together. 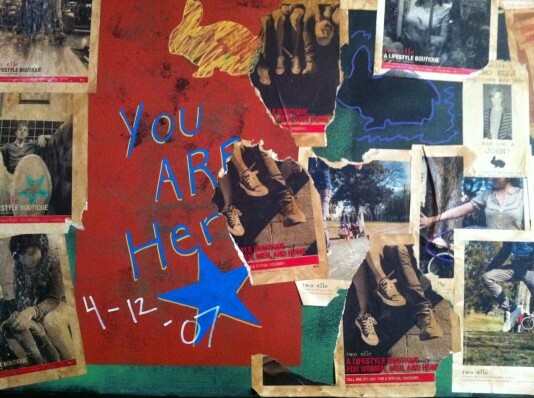 She began this journey in a small house with a red door on 12South. While there, she met many of you, shared many joyous walks through the neighborhood, and collected treasured moments. Then, in 2009 she moved her wonderland to The Hill Center. There were new treasured moments, new red doors, and new cherished family and friends whose impact have further defined and personalized what this journey is all about. Now, after Christmas this wonderland will close its doors. We will officially begin our close-out sale on Black Friday. 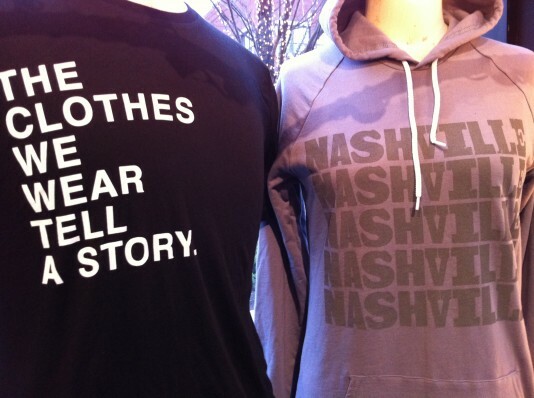 Surely, there will be deals, but our bunny and Nashville shirts and sweatshirts will not be marked down. They are now becoming collector’s items and are already quickly selling out. We also encourage you to ask us about our furniture and fixtures. Perhaps you can now create a little wonderland in your own home. And so, as is the case in all good stories, this chapter has come to an end. The girl will crawl out of the rabbit hole and press on to her next adventure. Your kindness, support, admiration, and compassion will inspire each step we take through the looking-glass and beyond. For that, we cannot thank you enough. It’s been a lovely fall, bunnies, but the time has come to say goodnight.